It's been a long time since I posted any time. But there's so much else that's happening. For instance trying to finish my BA in international studies, while I'm studying medicine. Since I last posted anything here, I've finished some knitting projects. Det er ei stund sidan eg har blogga. For tida er det så mykje anna som skjer, med studiar og flytting. Sidan sist har eg hatt høve til å gjere ferdig nokre strikkeprosjekt. Notes: Love the dress. It 's a really fast knit. I used about 2 weeks, but I've heard about knitters who has used only a couple of days. I'm considering making another one. In that case, I would use a larger needle on the "berry pattern". Eg er særs nøgd med modellen Klukka, og tenkjer på å lage enno ein . Då vil eg gjere nokre endringar, stirkka skjørtet litt lengre, og nytte ein pinnestorleik større på "bær"-mønsteret. Yarn: Rowan Felted Tweed, Wheat. 7 skeins. 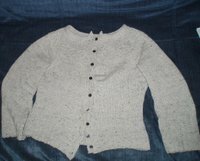 Notes: It has taken me some time to finished this jacket, due to christmas knitting, exams and Klukka. I'm really satisfied with the result. The jacket has quickly become one of my favourites, and I've also received several compliments about jacket:) Most of the jacket was easy and fast to kn it, the only thing that took some time was the Cabel-pattern. But that was really fun and interesting to knit, in my opinion it's also what makes this jacket slightly more that "just" a jacket. Det tok meg litt tid å gjere ferdig denne jakka, mellom anna pga julegåvestrikking, eksamnar og Klukka. Eg er verkeleg nøgd med det endeleg resultat, og jakka har vorte ein favoritt hos meg. Det var gøy med flettemønster, noko som gjer jakka til noko ekstra. I've joined a KAL, Klukkalong. 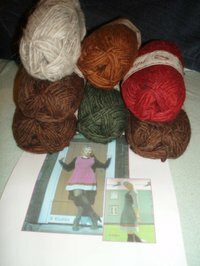 Today the pattern and yarn arrived, so now I'm going to cast on. 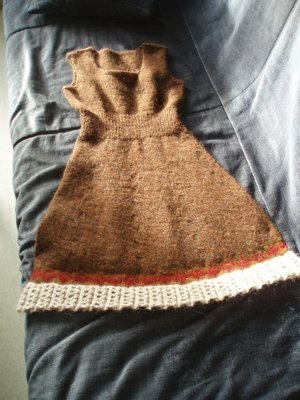 It's knitted in Light Lopi from Iceland, and it's the first I'm knitting a dress for myself. I really liked my espresso-maker, bought in Italy this summer, and discovered they are slightly more expensive in Norway. But suppose I should be happy that the espresso-maker was the only thing that got destroyed. I've also just operated out a tooth which has made me a temporally "addicted" to pain killers:) All this made me therefore decide to leave the city and visit my sister and here family for a night. Which was lovely, despite the fact that my four-year-old nephew woke me up at 7 am a Saturday morning. Some knitting has also been done this week. 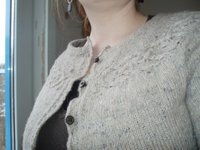 I've finished the garter rib of the Tangled Yoke. I ended up with the colour Wheat. When I saw t he colour in real life, I liked it better than what I have seen in pictures. Believe the colour is a wise choice. I also decided to follow the pattern due to the seam stitch, wonder how it's going to turn out. Wish you all a nice weekend.